We hire for Attitude. We train for Skill. FRESH CONCRETE AVAILABLE WHEN AND WHERE YOU NEED IT. Find out how our concrete can make your next job a success. Hydro vac services from trained professionals. Ontario's largest legal payload hydro excavator. World Class Technology. Local Service. Why Super Sucker? We’re faster, cleaner and safer. What We Do More than just hydrovac excavation. Work For Us You have to dig deep to work here. 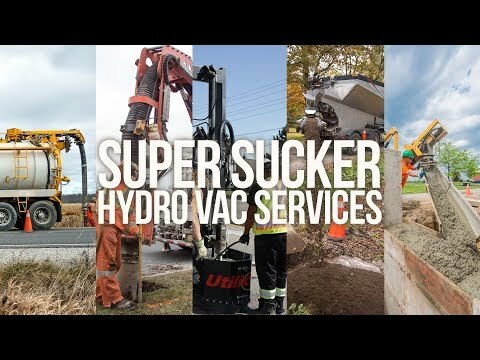 Welcome to Super Sucker Hydro Vac Service Inc! We are a safety-focused total solutions provider with a large fleet of hydrovac excavation trucks, coring units, slingers, and concrete trucks. This fleet allows us to service small and large projects throughout Ontario. Our experienced and professional team ensure the best results. Blessed Easter: Jesus...the resurrection and the life!